So, today we take a look at the history that the game The Legend Of Zelda – Oracle of Seasons has. The Oracle games are my favorite Zelda games. I’m only going to write about Seasons. If you are interested in the article about Ages, you should go to AdventureRules, since it’s there. For this article, I took out my Hyrule Encyclopedia and started reading all over the internet. So, I can tell you about this game that originally started as a trilogy but got split into two games. Let’s go to Holodrum again, together and let’s take a look at how this game got created. As usual, feel free to leave a comment with your opinion on the article and/or if I have missed anything interesting. First third party Zelda games. I remember the time I first booted up this game quite well. This game got released in late 2001 here in Europe. I was introduced to the Zelda series, two years later. When the Gameboy Advance SP dropped. At first, I picked up an “NES Classics: The Legend of Zelda I” from my local video game store. When I played that game, I fell in love with the Zelda series. A month after that, I went to the seaside with my family. There, I went to a garage sale and saw “The Legend Of Zelda – Oracle of Ages”. I didn’t think twice and I picked the game up. I finished the game a month later. That’s when I saw the “TO BE CONTINUED IN SEASONS”-screen. It took me several garage sales, but I could hunt my own copy of Seasons down in 2004. Sadly, it was a fake cartridge. But in 2005, a friend of mine sold his boxed copy of the game for 10€ to me and I had the original cartridge boxed. Now, I own both the cartridge and the 3DS eShop version. That’s how I acquired my very own copy of the game. I don’t own the fake cartridge anymore since I sold it on a garage sale after I got the real copy. During my playthrough of the game, I always felt that this game could be part of a trilogy. I mean, how two Goddesses are represented in the Oracle games. So, I went digging. I was right, this game was, in fact, going to be part of the trilogy. In fact, back in 1999, this game was called “The Mystical Seed of Courage”. Capcom made a demo for the Space World Expo. Wait, what? Capcom? Is this a mistake? No, actually it isn’t. Capcom created this game. The Oracle games are actually the first third party Zelda games planned to be externally created. The Zelda CDi games might be developed and published a few years earlier, but those weren’t planned by Nintendo. Capcom proposed to Nintendo to re-create the original The Legend Of Zelda I NES game. Yoshiki Okamoto pitched his idea to Shigeru Miyamoto. Yet, the development team said “NO!” to Okamoto’s ideas and started to create a new title in the series. The subsidiary Flagship was tasked to write the story. This didn’t prove successful since they prioritized story over gameplay. Thankfully, Miyamoto’s help came to the rescue. Miyamoto had the idea to create the “Triforce Series”. The Zelda formula as we know and love would be split into three. So, in 1999 the more action-based game was presented to the public. The subtitle the game got was “Mystical Seed of Power” and on the 1999 Space World Expo, it even had a different subtitle “Chapter of Power” or “Tale of Power”. 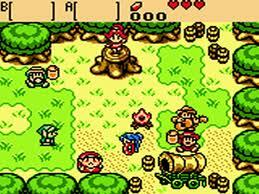 The demo started with Ganon kidnapping Princess Zelda and the Rod of Seasons. The demo itself has a lot of elements that made it into the final version of the game. There are some major differences though. The first difference is that in the final game, Onox is introduced as the big villain who kidnaps the Oracle of Seasons, Din. The second difference is that the game doesn’t take place in Hyrule but in Holodrum. And the 3rd difference is that it’s not Hyrule Castle that sinks into the underworld, but it’s the castle of Holodrum. So, why did we get two games instead of three? The reason for that is the game-linking system. You could interact with the other games via codes. But, this proved too difficult to develop, so only two games were to be developed. Everything from “The Mystical Seed of Power” got into the game we now know as “The Legend of Zelda – Oracle of Seasons”. Yet, you can still see signs of the first Zelda game in this title. Remember, this game first started out as a remake of the original Zelda game back on the NES. Take the old men, several recurring bosses and the Gnarled Root Dungeon. The Goddess that didn’t get her own game, the “Mystical Seed of Courage” which got canceled, appears in both Oracle titles. She is in the Hall of Secrets. I said it before and I’ll say it again, the Oracle games are my favorite Zelda games. I have beaten them repeatedly. I enjoy them so much. I especially love the mechanic where you can transfer over some progress from one game to the other. I can’t choose my favorite game between both Oracle games. To finish my article, I want to give 5 memories I have with this game. So, here we go. There is one dungeon boss I always have trouble beating. That’s the boss Manhandla in the 6th dungeon called Ancient Ruins. This boss is so difficult since you need to hit his head with the boomerang and getting to the boss door is such an ordeal. It’s highly recommended to get the LVL2 shield and sword to defeat this boss. I remember one time when I finally had beaten that boss, I shouted in excitement. But, I had forgotten that it was past my bed time. My parents weren’t too pleased when they caught me. My Gameboy was taken from me for a month. When I was 12, I used to make maps and write guides for all my games. I also wrote each level code I had down on a list. All these guides and such were bundles in a folder that set on my shelf. I still remember writing a complete step-by-step guide how to get the LVL2 sword. But, I did the quest so much, I can now do it in the game. Apart from the maze bit at the end, I always forget the sequence. To get access to a dungeon, you need to collect a certain number of gems. I found two of them before I knew what they were for. I was so proud of myself. I seriously love how the Natzu area differs from the animal buddy you get. But, I feel that Dimitri’s one is a bit useless. Since not too long after that, you get the flippers which make the unique ability of Dimitri useless. Since you can swim in the water now. The only thing you can still use him for is to eat enemies while you are in the water. I have beaten Veran, Oracle of Ages main villain, multiple times. But, I have only beaten Onox twice. I always have trouble in his boss battle. But, I have beaten Ganon on my cartridge of Seasons… but, disaster struck. The internal battery died and I lost my save file. In any case, thank you for reading this article. I hope you enjoyed reading this as much as I enjoyed writing it. I hope to be able to welcome you in another article on my blog, but until then, take care and have a great rest of your day! One final thing, if you enjoyed reading this look back on the development and my personal memories of this game and you would love to read more articles like this from other games in the Zelda series? Well, don’t think twice of reading the hub article! 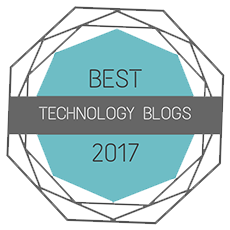 Since this article is part of a big collaboration I did with various other bloggers! You can check that out here. This entry was posted in Articles, Gaming History and tagged 001, 3DS, Ages, arpegi, better, blogging, cancelled, capcom, develop, development, eshop, games, Google, history, information, jea, Jonez, jonez001, jonezjea, Legend, life, massive, mobile, more, music, mystical, neko, NekoJonez, Of, Oracle, project, review, seasons, seed, seeds, series, test, The, triforce, trilogy, WordPress, Zelda on October 1, 2017 by NekoJonez. 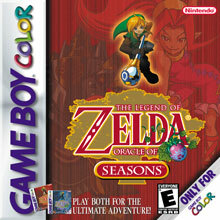 Review #004: The Legend Of Zelda – Oracle Of Seasons ~ Which weather do we take today? Link to the page in the Zelda wiki about this game. So last review we went over the sister game of this game. Or brother game, whatever you prefer. I gave the Oracle Of Ages game a very high score. But is this game worthy of the same praise? It was released on the same day but that could make it flawed and feel very rushed. Well, for that you will need to stick around at the end of the review to get your answer. One thing I already can tell you, the game is pretty neat. But now I will dive into this game. The game that you need to play after Oracle of Ages, or before. It’s not that I’m trying to write this intro as long as the image for making it visually more interesting to read. Okay, I might be just doing that. So, enough rambling about the intro here and let’s dive into this game and check if it’s actually good or not. Maybe I lied earlier in the introduction, who knows? In this game’s story you aren’t left alone. The introduction of the game is the same as the Oracle Of Ages game, you start by riding you trusty horse Epona. (Dirty minds aren’t my problem.) So, now the first people you meet actually claim that Din saved you. Which is strange, since they let you rot two screen away in the bushes. In the other game you talk to animals which doesn’t get explained, but who cares, it’s an adventure game. In this game, the problems pop up way sooner as Din is kidnapped. To be fair, this game has a great story. It might be your standard “rescue the kidnapped damsel in distress” but it has a twist in this game. What’s pretty neat in this game is that you can change the seasons once you have the season staff. A concept I liked over the Ages game. The story is now about a sleepy tree that aids you on your quest. Lucky for us, the tree doesn’t want to marry us. As you don’t receive the blade right away, it’s obvious that this game has less puzzles and more action. Yes, the Oracle games have split the Zelda formula in half. This is the more action game. As the other Oracle game, this game has also a 2nd dimension. It’s smaller, but it does the trick. I even dare to say that this game’s world is bigger then the ages game. In the other dimension, the characters look like they are fans of Link. They all wear a green tunic, but in overdrive. And this brings us to a disappoint point of the game, the bosses and some characters are and feel borrowed from previous games. As it’s an awesome nod to the older games, it makes the game feel a tad bit creative. There is certainly missed potential with remaking the bosses of the older games. Yet, to be fair, the animation is great in this game. I really enjoyed the animation in this game and it really pulled me in this game. Also the graphics are extremely well done. How fast you can move through the seasons is better compared against the longer time travel animation of the Ages game. The worlds look colorful, and white in the winter, and lively. The game has multiple chase quests that can get frustrating because of the limitations of the gameboy. It still is impressive how the code linking works. If you named the child in the Ages game, the child will be here in the Seasons game. Like in the Ages game, there is also a trade quest, with the same pay-off. Play it to check it out. The game is difficult. No doubt about that. You won’t go through this game in one sitting. The controls are pretty tight and if you die, it’s your fault. Even the jumping is less annoying the in the Ages game. The items are actually creative. It still has the same gameplay as all the other Zelda portable games but like I said in my previous reviews, it’s extremely well implemented. But back on the subject of the items. You have great items, some of the Ages game, that you get to aid you in your quest. This game might be more difficult then Ages in terms of action but the puzzles in this game can be pretty hairpulling sometimes. The biggest hair pulling moment is where you need to fight Onox. The final boss is extremely difficult because you need to use your spin attack, which is difficult to pull of since he uses Din as a shield. With Veran in Ages I had less trouble. The challenge is still pretty fair and after some practice you get the pattern down and you’ll be able to defeat him. The last thing but not least, are the music and the sound effects. Like in Oracle of Ages, the sound effects are pretty standard. But the music is still pretty amazing. I extremely enjoy the music and really sets the mood. It’s really upbeat and the melodies sometimes kept stuck in my head for days on end. Oh, before I forgot. In the Ages game you were able to select the track you wanted easily. Not here, if you want the right season, it’s using the staff on a tree stump and hoping it goes to the right season. Little bit annoying though. + Extremely well done music. – Soundeffects are pretty mediocre. – The seasons should be better selectable. – Missed opportunity with the final bosses. Do I truly need to repeat myself? This game is extremely well done but is a bit weaker then the Ages game. The game world is pretty big so this game will least you quite a while. I seriously enjoyed this game and I replay it often. I missed the moments where I was able to explore the game for the very first time since then the game is the most fun. This entry was posted in Reviews and tagged action, adventure, Ages, capcom, color, game, gameboy, gbc, Jonez, jonez001, Legend, neko, NekoJonez, Nintendo, Of, Oracle, review, seasons, The, Zelda on May 24, 2013 by NekoJonez.